For those of you that watched the NBA Rookie Sophomore challenge - you were given more than a healthy dose of defense, dunks and dimes. All-Star festivities bring something else to the table as well - lots of special edition kicks. While Nike hooked up each of their marquee athletes with individual colorways (see: Kobe, Lebron, Durant, Melo, CP3, D-Wade), Adidas tried to step outside the box a bit and have all of their athletes rock the same shoe (World Cup Strategy) - as Jrue Holiday, Wesley Johnson, Serge Ibaka, Taj Gibson, James Harden, and Steph Curry all wore these eye-catching, yellow 'Adipure Mids'. Great thought - if the shoes weren't hideous (Note -Adidas athletes Dwight Howard and D-Rose (2nd pair) got their own special kicks too - but they are also so beneath the radar I hardly want to link to them). 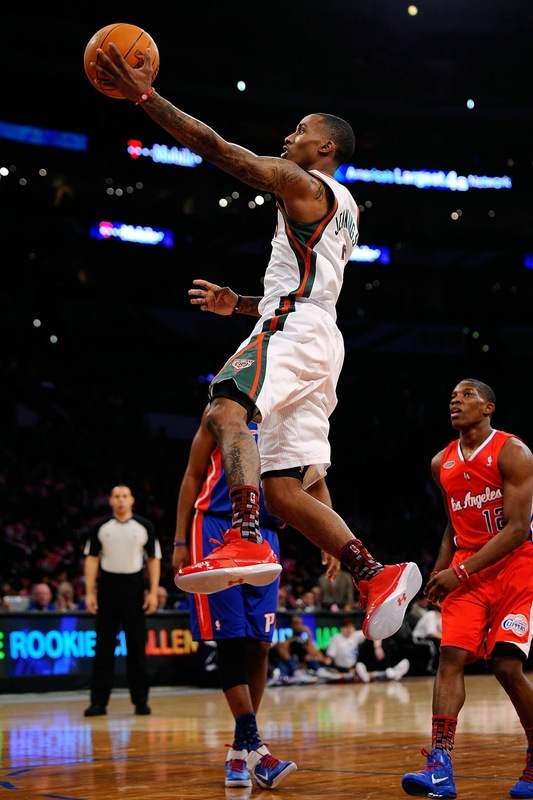 In my opinion though, Young Money Brandon Jennings (#Compton) stole the show with these red on red Micro G Black Ice Low's (pictured above). Talk about CLEAN colorways! Never owned a pair of Under Armor kicks so I can't attest to their performance level - but from a style standpoint - branding aside- these look good on the court. Oh - and Twitter rant aside - I liked the socks everyone was wearing. Speaking of Twitter, hit me up (twitter.com/princeofgundo) and let me know whose kicks stole the show. With tonight being "All-Star Saturday Night" and the Big game being tomorrow - I'm sure there will be a lot to talk about.